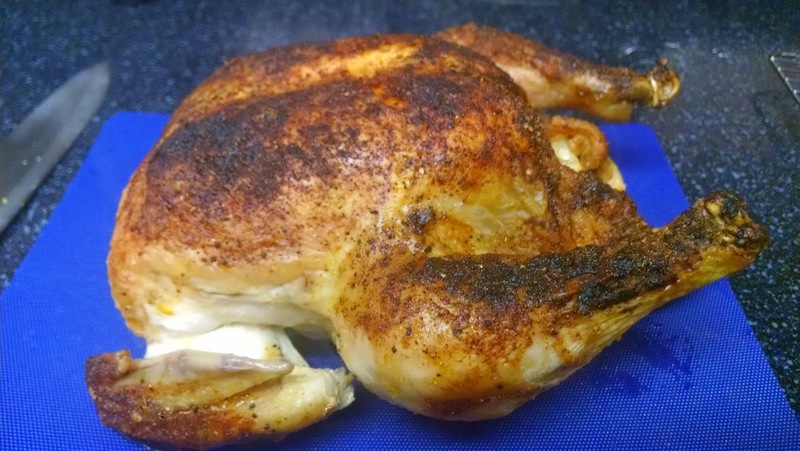 As I alluded, you will never look a store bought rotisserie chicken the same after you try this recipe. I believe that this will be a recipe you come back to time and time again. Whether you make this chicken on a week night, special occasion, it won’t matter — it’s so delicious you just might dream about it! 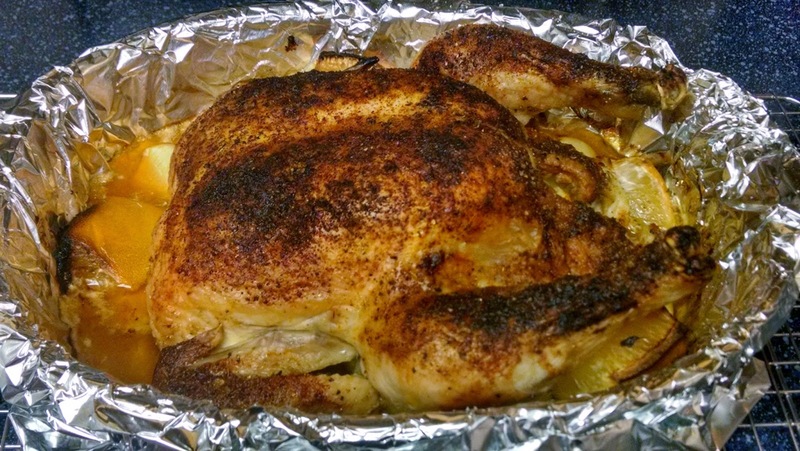 The recipe am I using has been adapted from the Lemon and Garlic Roast Chicken from Ina Garten. I have provided the full recipe via the link below. Don’t bother with the bacon. Originally, we were concerned about the bacon being used mostly for flavor and keeping the meat moist, but we wanted to know if the recipe could be done sans-bacon. Little did we know, that this would be the dream recipe. However, the bacon was giving us reason to reconsider. Although we had great success without the bacon, to make sure we were being fair to the recipe we made it with the bacon to see what would happen. Honestly, we noticed very little difference and it didn’t impact the flavor profile at all. So, for us, this wins without the bacon time again. As you can see, we love our bacon, so this isn’t a knock against our favorite smoked meat, just about what it brought to this party. As you can see from the photo included below, you don’t need to worry about tying the chicken legs together. It makes the presentation look really cool, but it is not necessary for a successfully roasted bird. Save the gravy train. As I have stated, this chicken has plenty of flavor and will be more than moist. Also, if you need a little extra sauce, spoon over a bit of the pan drippings over the chicken meat, as the flavor from the lemons will bring a much needed reprieve from the richness of this meat. Above,are the ingredients that you are going to use to stuff the cavity and below is what the cavity of your bird should look like. Layer as follows, half a head of garlic, 2 lemon quarters, fresh thyme and fresh rosemary, 2nd half the head of garlic, and last two quartered lemons. The peeled garlic cloves we will use later. Okay, here is the chicken ready to go in the oven. Two important tips, you can go a little lighter on the paprika and that will help the skin of the chicken not be so dark as it cooks. Note: Make sure to place your oven rack on the lowest position in the oven before putting the chicken into the oven to roast. 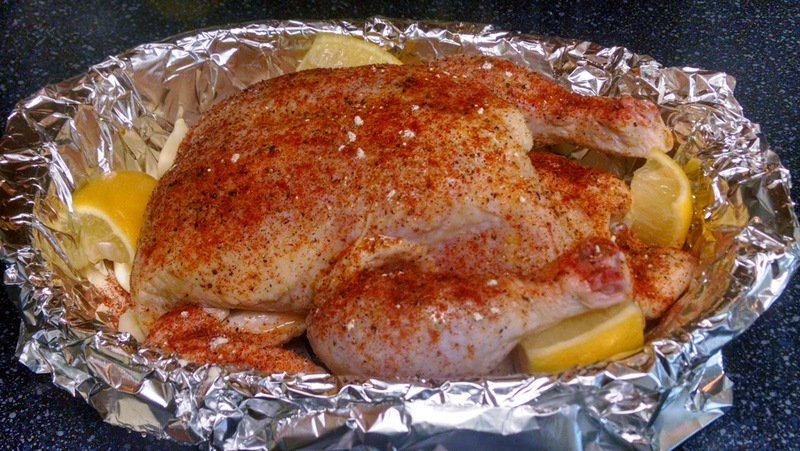 While roasting, if you think the skin is getting too dark and you still have a lot of time left to go, cover the chicken with foil for the last 30 minutes or so. This will keep the skin from getting too dark. In order to keep the bird moist, pull the chicken out of the oven after roasting for 1 hr & 25 minutes to 1hr & 27 minutes. You are going to let this bird rest on a cooling rack (an oven mitt or you can put it on a cold burner if you don’t have a cooling rack) and it will finish cooking — otherwise known as carryover heat. So it is OK to pull the chicken out just a couple minutes early. 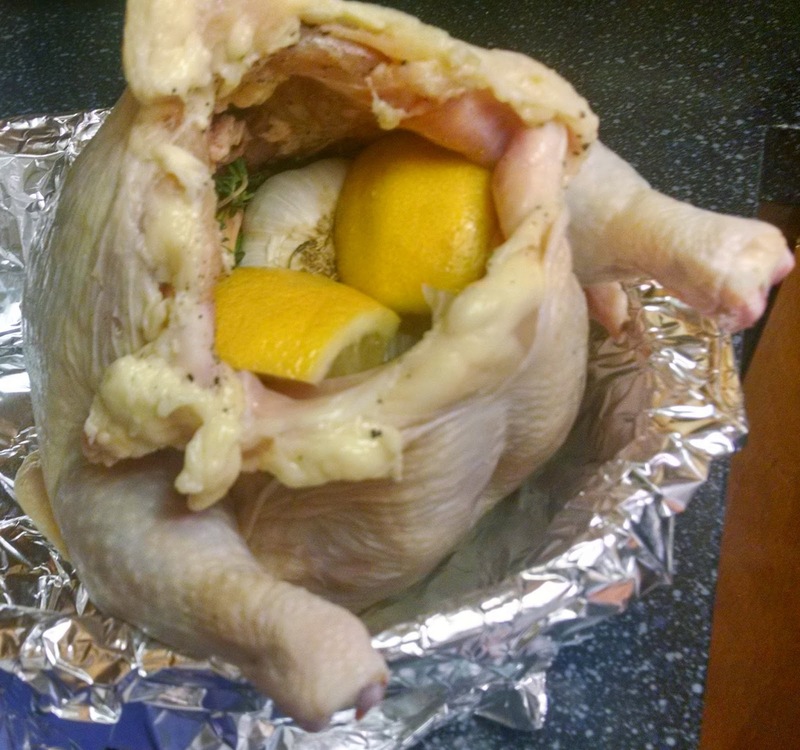 After you pull the bird from the oven, let the chicken rest for 15-20 minutes covered in foil to cool. Then you are ready to move it to a cutting board and slice. When you are ready to save your leftovers, remove the aromatics from the cavity as they can leave a funny flavor in the chicken once it’s been cooked.